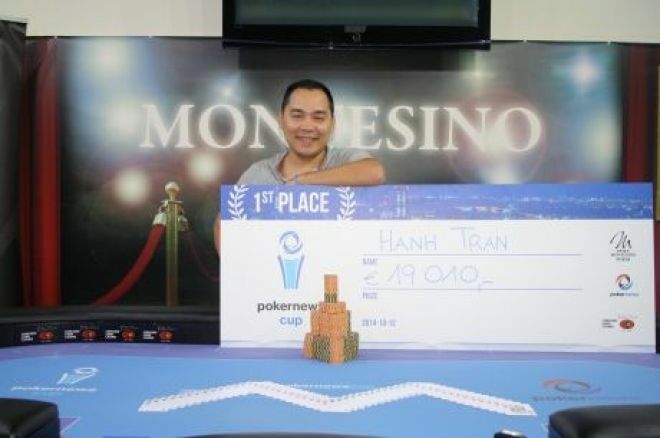 After another exciting day of play at the Montesino Casino, Austria's Hanh Tran managed to write his name in the PokerNews Cup history books by taking down the 2014 Main Event in his home country on Sunday. A former tournament director turned professional poker player, Tran battled his way to the title by outlasting a field of 367 players that participated in the fifth edition of the PokerNews live tournament series. Together with the honor of becoming the fifth PokerNews Cup champion, Tran celebrated his success by collecting the €19,010 maxi-check awarded to the main event's winner after a three-way deal made with the runner-up Fabian Gritsch and the third-place finisher Lubos Trembecki. The two ended the tournament with a €12,610 and €10,000 payday, respectively. The Main Event's final day saw 101 players return to the tables after the three starting days played at Montesino and at Vienna's Concord Simmering Casino. One of those players, Klemen Kramljiak, finished in 33rd place for €590 and described his experience with PokerNews. "I first heard about PokerNews Cup reading the Slovenian PokerNews site. I registered to one of the exclusive satellites on DuckPoker, and won my ticket there," said Klemen Kramljiak. "I'm pretty sure I would never have traveled to Vienna otherwise. Even with the ticket and the hotel settled, I was a bit worried since I got here by myself and I didn't know anyone. Fortunately, everybody was really kind and helpful, and I have also managed to make some new friend during the event." "To crown the whole experience, I earned a lot of money during just a couple of days," Kramljiak concluded, referring to the fact that he had also finished third in the €75 second chance event on Saturday for a €950 prize. 2015 PokerNews Cup to Feature a €200,000 Guarantee! Following the success of the fifth edition of the series, PokerNews decided to up the ante and announce a €200,000 GTD Main Event for the 2015 PokerNews Cup to be held from February 4-9, 2015. The tournament, which will keep the same €250 buy-in, will be included in a much richer program of events that will feature an €85 buy-in €5,000 GTD PokerNews Cooldown tournament, and a pot-limit Omaha event with a €10,000 guarantee. For its seventh edition, the tournament will leave Vienna and move to the King's Casino in Rozvadov, Czech Republic. "The seventh edition of the PokerNews Cup is going to be an amazing event," said iBus Media and PokerNews CEO Jon Squires. "For a very low buy-in, the series will offer every participant the unique opportunity to sit at the tables for some top poker action, compete for a significant guaranteed prize pool and enjoy the great exposure that only a global poker media as PokerNews can offer." "Like PokerNews, also at King’s Casino we strive for excellence," said the owner of King's Casino Leon Tsoukernik. "By coming to the PokerNews Cup, players will get the chance to discover one of Europe's best casinos with cash tables and casino games running round-the-clock." PokerNews Cup Vienna Day 1b: €75,000 Guarantee Shattered!